"me too-itis": a behavioral condition afflicting groups of bird watchers, especially on birding mailing lists. This disease usually takes the following course. A single rare bird is reported to the bird mailing list and all of a sudden everyone else and their brother reports the species in all sorts of places. For instance, in the West, Semipalmated Sandpipers are fairly rare. And smaller shorebirds ("peep") are notoriously difficult to identify--especially for beginners. Nevertheless, every fall, as soon as someone reports a bird on the local birding list, several other "me too" posts appear over the next couple of days. What does one make of this? It seems there are several possibilities. It could be that these birders actually are observing and correctly identifying a rare bird. After all, many persons go looking for the same individual bird reported at the correct location. They could be seeing the exact same bird at the same location. Migration takes place at approximately the same time for the same species. Weather conditions enable or limit migration such that if one rare bird shows up, it is possible several could have traveled the same route. A third possibility is that more inexperienced birders are actually seeing rare but regular species but feel unsure of their ID until "encouraged" by other reports. This last possibility could easily morph into birders who are encouraged by other reports into "seeing" birds that aren't really there--mistaken identification. I am sure that all four of these possibilities account for "me too" reports. But I don't know the ratio, which one is most frequent, if any. Here are more examples of "me too-itis" that I have noted. Dark-eyed Juncos are abundant winter visitors to towns in the Pacific Northwest. They are found in towns such as Portland, Oregon in high numbers, before migrating north or upslope in the spring. Many "me too" reports come for the "first" birds of the fall at backyard bird feeders. The trouble is, Dark-eyed Juncos are also uncommon permanent residents in Portland and most towns in the Willamette Valley. Just because the local birds have been secretive during the nesting season before bringing their offspring to the local feeders in fall does not mean they are the first migrants from far away. A rare bird is reliably reported daily for several days or weeks at a location. Yet there is always a report a week or two after all others could no longer find it. "Me too" wishful thinking? Concerning this loon and mass mistaken identification, Jeremiah Trimble wrote, "One pitfall that many of us can fall into when chasing a rarity is failing to critically identify the bird on our own. In other words, we go to the location where a rarity was reported and see a bird (maybe THE bird) and simply accept that we are seeing the reported rarity." Kaufman's Field Guide to Advanced Birding (2011) has a section on "common pitfalls of field identification." Pitfall 1 is expectation and desire. "Our subconscious drive to find a rarity can genuinely alter our perceptions," he wrote. The final example of "me too-itis" resulted in a rare bird NOT being accepted by the Bird Records Committee. An Eastern Phoebe was reported with detailed description from a rest area in eastern Oregon near Malheur NWR. This was during the Memorial Day weekend when the desert there is swarming with birders looking for rare Eastern vagrants. Word got out that afternoon and by dawn the next morning scores of birders had descended upon the rest area. Everyone reported the Eastern Phoebe in the same trees and acting just like had been reported the previous day. Many photos were obtained. The later examination of all photos turned out to be Willow Flycatcher, a common bird in the area that really doesn't look that much like a phoebe. 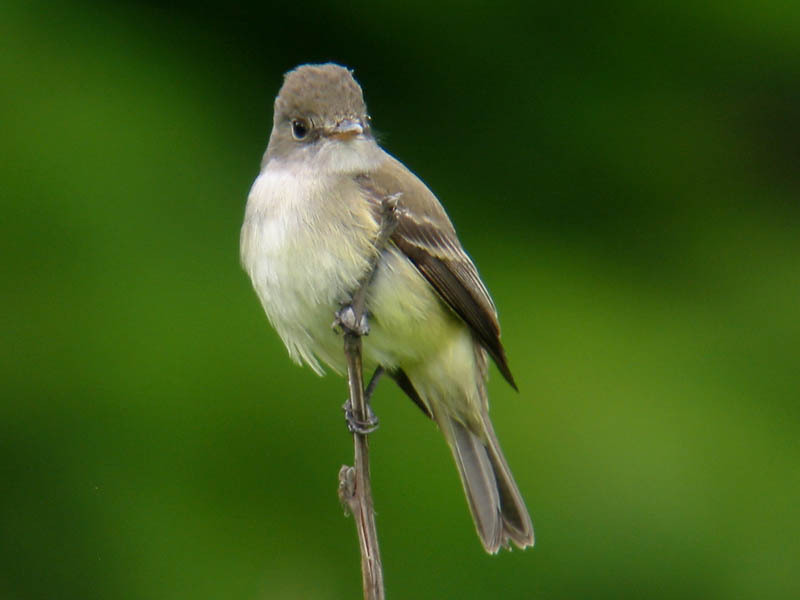 Now, was the original sighting an Eastern Phoebe or was the original ID incorrect too? The "group hypnosis," the desire for it to be a rare bird, made analyzing the original sighting without bias impossible. So, let's be determined when viewing a previously reported rare bird to follow Jeremiah Trimble's admonition and "critically identify the bird on our own"! Well, everyone makes ID mistakes--even groups of people. Mistakes (birding or otherwise) can be great learning experiences. A great post and one that had to be written. Hopefully many birders read this. This sort of thing happens very often, and I have seen it in action here in PA many times. Not only is it incredibly important that you ID the reported rarity on your own for the sake of making sure you are in fact looking at the actual rarity but also just for personal identification gains. So often I see people at chases that, once the bird in question is spotted, look at the bird briefly in their binos and/or scope and then that's it. They just go back to talking to the others birders and sort of 'ignore' the rarity. What is the point of that? If you are fortunate enough to see a rarity in your area, take the time to LOOK AT and LEARN the bird! Maybe you will then be able to find a rarity on your own because of those skills you gained after really putting in the time to properly observe the bird when you had the chance. After all, isn’t that the point of birding – to learn the species and be able to properly ID them? Excellent comments, Alex. Learning is a key component of birding for me. Alas, not for all. The skylark story is embarrassing...but it was 1978. The field guides available at that time were junk compared to all the resources we have today, so I think it is sort of understandable. Very good post! One of the things that A birder once said to me was something like "You don't see rarities - thats why they are rare. Assume what you see is common and work from there - not the other way around!" - I think this is talking about the same thing as your post! That's right, Stewart. Always ask yourself: "Why isn't this just an unfamiliar (to me) plumage of the most-similar common expected species?" very good post. Perception is so subjective, and as I learn more, I try to be more objective and list my observations why I think a bird is what it is (to myself). I also like to report a bird that might be rare as a maybe or a trouble ID , rather than not report it, so the experts can see too. Wise words, Dan. Memories are plastic--the more you think about a bird sighting the more you change your memory. Thus, ALWAYS write down a description of a rare bird IMMEDIATELY after viewing--and BEFORE looking at a field guide! As for reporting a rare bird--even to the local mailing list--always give a brief description of what you saw so that others can decide for themselves. The bird's name isn't what you saw, it's a conclusion that may or may not be correct.